Deep Learning has become a household buzzword these days. Google, Microsoft, and Tencent have developed distributed deep learning systems but, these systems are closed source softwares. Many of open source softwares such as DeepDist, Caffe, ..., etc are data parallel only. 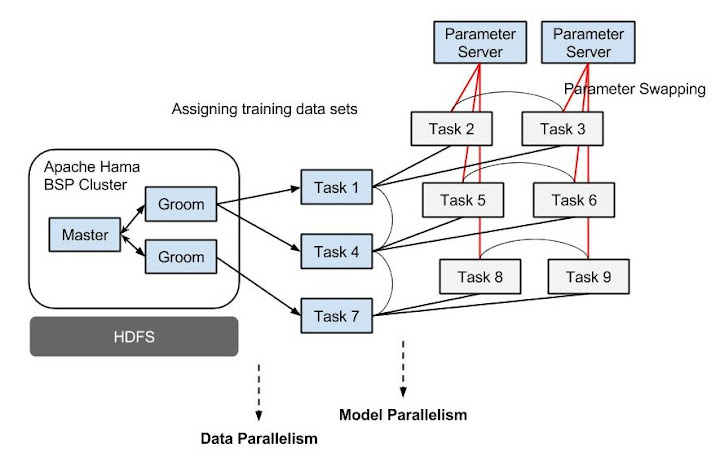 In this blog post, I introduce an Artificial Neural Network implementation of Apache Hama ML package and future design plan for supporting both data and model parallelism. The lastest Apache Hama provides distributed training of an Artificial Neural Network using its BSP computing engine (the initial code was contributed by Yexi Jiang, a Hama committer, Facebook). In general, the training data is stored in HDFS and is distributed in multiple machines. In Hama, two kinds of components are involved in the training procedure: the master task and the groom task. The master task is in charge of merging the model updating information and sending model updating information to all the groom tasks. The groom tasks is in charge of calculate the weight updates according to the training data. The training procedure is iterative and each iteration consists of two phases: update weights and merge update. In the update weights phase, each groom task would first update the local model according to the received message from the master task. Then they would compute the weight updates locally with assigned data partitions (mini-batch SGD) and finally send the updated weights to the master task. In the merge update phase, the master task would update the model according to the messages received from the groom tasks. Then it would distribute the updated model to all groom tasks. The two phases will repeat alternatively until the termination condition is met (reach a specified number of iterations). The model is designed in a hierarchical way. The base class is more abstract than the derived class, so that the structure of the ANN model can be freely set by the user, as long as it is a layered model. Therefore, the Perceptron, Auto-encoder, Linear and Logistic regressor can all be uniformly represented by an ANN. As described in above section, currently the data parallelism is only used. Each node will have a copy of the model. In each iteration, the computation is conducted on each node and a final aggregation is conducted in one node. Then the updated model will be synchronized to each node. So, the performance is one thing; the parameters should fit into the memory of a single machine. Each task asynchronously asks the Parameter Server who stores the parameters in distributed machines for an updated copy of its model, computes the gradients on the assigned data, and sends updated gradients back to the parameter server. This architecture is inspired by Google's DistBelief (Jeff Dean et al, 2012). The model topology: including the number of neurons (besides the bias neuron) in each layer; the type of squashing function; the degree of parallelization for each layer. The learning rate: Specify how aggressive the model learning the training instances. A large value can accelerate the learning process but decrease the chance of model convergence. Recommend in range (0, 0.5]. The momemtum weight: Similar to learning rate, a large momemtum weight can accelerate the learning process but decrease the chance of model convergence. Recommend in range (0, 0.5]. The regularization weight: A large value can decrease the variance of the model but increase the bias at the same time. As this parameter is sensitive, it's better to set it as a very small value, say, 0.001. // set the activation function and parallel degree. In closing this blog post, I would like to request your feedback about design ideas. Please feel free to drop a comment or send a mail to our dev@hama.apache.org mailing list. Thanks. Apache Hama announces v0.7 Release! Apache Hama team is pleased to announce the release of Hama v0.7 with new features and improvements. Hama is a High-Performance BSP computing engine, which can be used to perform compute-intensive general scientific BSP applications, Google’s Pregel-like graph applications, and machine learning algorithms. What are the major changes from the last release? The important new feature of this release is that support the Mesos and Yet Another Resource Negotiator (YARN), so you’re able to submit your BSP applications to the existing open source and enterprise clusters e.g., CDH, HDP, and Mesosphere without any installation. In addition, we reinforced machine learning package by adding algorithms such as Max-Flow, K-Core, ANN, ..., etc. There are also big improvements in the queue and messaging systems. We now use own outgoing/incoming message manager instead of using Java's built-in queues. It stores messages in serialized form in a set of bundles (or a single bundle) to reduce the memory usage and RPC overhead. Unsafe serialization is used to serialize Vertex and its message objects more quickly. Another important improvement is the enhanced graph package. Instead of sending each message individually, we package the messages per vertex and send a packaged message to their assigned destination nodes. With this we achieved significant improvement in the performance of graph applications. The attached benchmarks were done to test scalability and performance of PageRank algorithm for random generated 1 billion edges graph using Apache Hama and Giraph on Amazon EMR 30 nodes cluster. Note that the aggregators was used for detecting the convergence condition in case of Apache Hama. Add stream input format for listening messages coming from 3rd party applications, and incremental learning algorithms. Improve reliability of system e.g., fault tolerance, HA, ..., etc. The release artifacts are published and ready for you to download either from the Apache mirrors or from the Maven repository. We welcome your help, feedback, and suggestions. For more information on how to report problems, and to get involved, visit the Hama project website and wiki. The Apache Hama team is pleased to announce that we’re now supporting not only the Mesos but the YARN (Thanks to Minho Kim who is a main contributor of YARN module). Apache Hama is a High-Performance BSP computing engine, which can be used to perform compute-intensive general scientific BSP applications, Google’s Pregel-like graph applications, and machine learning algorithms. 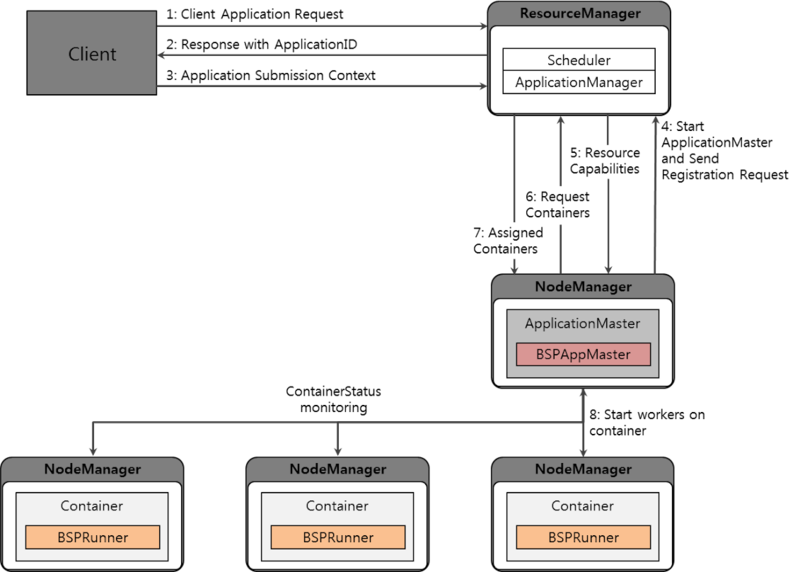 YARN is the resource management technology that lets multiple computing frameworks run on the same Hadoop cluster using the same underlying storage. So, for example, a company could analyze the data using MapReduce, Spark, and Apache Hama. “From the next release, you’ll be able to submit scientific BSP applications to the existing open source Hadoop, CDH, and HDP clusters without any installation” said Edward J. Yoon(@eddieyoon), a original creator of Apache Hama. Meanwhile, we’re also working on support the HPC environment such as InfiniBand and GPUs — According to General Dynamics, they already proved the 10x performance improvement of Apache Hama on HPC cluster — and also plan to support deployment and automation configurations to the Hybrid Clouds for solving various problems of Manufacturing Engineering, Science, Finance, Research areas. This contribution is mainly coming from Samsung Electronics. “Unlike most web services companies, our challenge is numerical or signal data, not text data. That’s why we’re investing in High-Performance computing for scientific advanced analytics.” said SeungHun Jeon, a Head of Cloud Tech Lab at Samsung Electronics. “Since we build our own analytics platform in the Cloud by leveraging open source technologies such as Apache Hadoop, Storm, and Hama, we intend to keep making contributions to the Open Source communities. ” added Hyok S. Choi, a Principal Software Engineer at Samsung Electronics. Apache Hama was established in 2012 as a Top-Level Project of The Apache Software Foundation. It provides High-Performance BSP computing engine on top of Hadoop. [ANNOUNCE] Hama 0.6.4 has been released. The Hama team is pleased to announce the Hama 0.6.4 release. Apache Hama is a pure BSP (Bulk Synchronous Parallel) computing framework on top of HDFS (Hadoop Distributed File System) for massive scientific computations such as matrix, graph and network algorithms. This release improves memory usage by 3 times better than before (without significant performance degradation) and adds runtime message compression. The artifacts are published and ready for you to download either from the Apache mirrors or from the Maven repository. We welcome your help, feedback, and suggestions. For more information on how to report problems, and to get involved, visit the project website and wiki. Already you might know, the Apache Hama project provides a set of machine learning algorithms which can be applied in applications with very large scale data in multiple domains. In this post, I explain how to run BSP-based K-Means algorithm using Apache Hama, assume that you have already installed Hama cluster and you have tested it. 1. 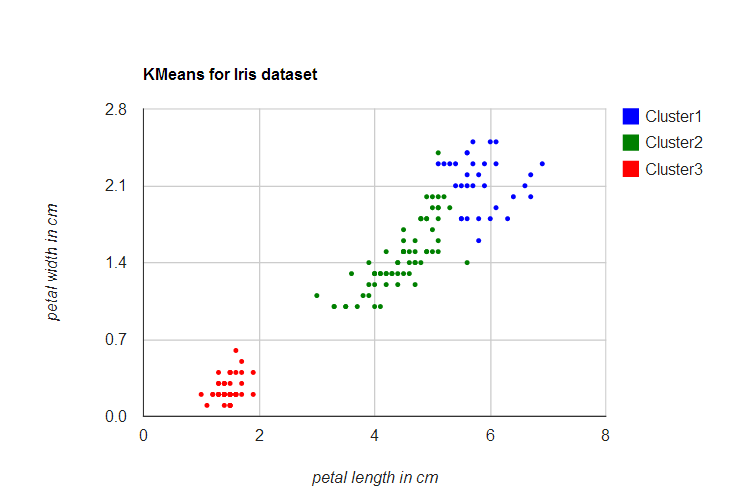 Download a Iris data set [Data set Information]. 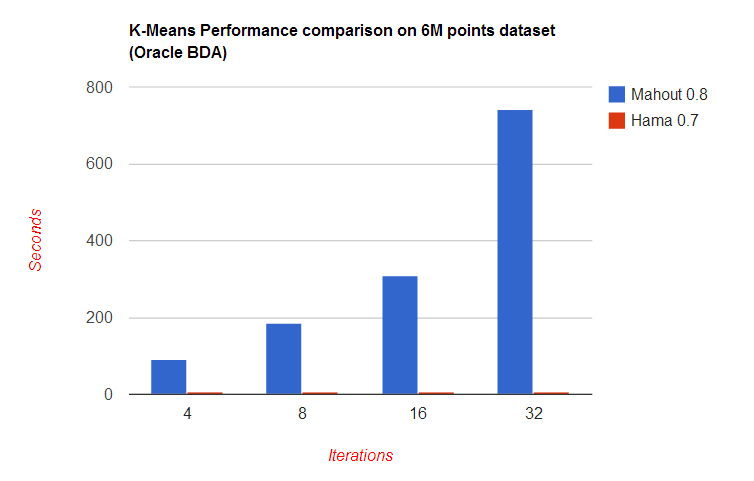 And Here's performance comparison with Mahout. The Apache Hama PMC is pleased to announce the release of Apache Hama 0.5.0.
computations such as matrix, graph and network algorithms. details, please take a look at our website and wiki. Many thanks to the Hama community for making this release possible. The Hama team is pleased to announce the release of Apache Hama 0.4-incubating under the Apache Incubator. Hama is a pure BSP(Bulk Synchronous Parallel) computing framework on top of HDFS (Hadoop Distributed File System) for massive scientific computations such as matrix, graph and network algorithms. Thanks to the Hama and Apache Incubating community for helping grow the project! 0.3-incubating under the Apache Incubator. You can be downloaded from the download page of Hama website. Thanks to the Hama and Apache Incubating community for helping grow the project. The Hama team is pleased to announce the release of Apache Hama 0.2.0-incubating under the Apache Incubator. Hama is a distributed computing framework based on BSP (Bulk Synchronous Parallel) computing techniques for massive scientific computations. Apache Hama in academic paper. Abstract—APPLICATION. Various scientific computations have become so complex, and thus computation tools play an important role. In this paper, we explore the state-of-the-art framework providing high-level matrix computation primitives with MapReduce through the case study approach, and demon-strate these primitives with different computation engines to show the performance and scalability. We believe the opportunity for using MapReduce in scientific computation is even more promising than the success to date in the parallel systems literature. How will Hama BSP different from Pregel? Firstly, why did we use HBase? Until last year, we tried to implement the distributed matrix/graph computing algorithms based on Map/Reduce. As you know, the Hadoop is consists of HDFS, which is designed for commodity servers as a shared nothing model (also termed as data partitioning model), and a distributed programming model called Map/Reduce. The Map/Reduce is a high-performance parallel data processing engine, to be sure, but it's not good for complex numerical/relational processing requires huge iterations or inter-node communications. So, we used HBase as a shared storage (shared memory model). Why BSP instead of Map/Reduce and HBase? Therefore, we started to consider about message-passing model, and decided to adopt the BSP (Bulk Synchronous Parallel) model, inspired by Pregel from Google Research Blog. According to my understanding, Pregel is graph-specific: a large-scale graph computing framework, based on BSP model. Hama BSP is a computing engine, based on BSP model, like a Pregel, and it'll be compatible with existing HDFS cluster, or any FileSystem and Database in the future. However, we believe that the BSP computing model is not limited to a problems of graph; it can be used for widely distributed software such as Map/Reduce. In addition to a field of graph, there are many other algorithms, which have similar problems with graph processing using Map/Reduce. Actually, the BSP model has been researched for many years in the field of matrix computation, too. Therefore, we're trying to implement more generalized BSP computing solution. And, the Hama will consists of the BSP computing engine, and a set of few examples (e.g., matrix inversion, pagerank, BFS, ..., etc). We're introduced in the BSP Worldwide. We're introduced in the BSP Worldwide : http://www.bsp-worldwide.org/bspww3000.html via Prof. Rob Bisseling. to your page and to the paper. I read it and find it very interesting. I heard a talk by Greg Malewicz from Google (Pregel) who is very enthousiastic about BSP. Suddenly I note a high interest in BSP everywhere.